This sweater looks absolutely beautiful on! I got the colour Condoran when it was still in stock and it’s stunning. I find the fit very flattering, not too tight, not too baggy. It’s quickly become a staple especially since it’s machine washable. I haven’t noticed any piling either even after a few washes. Great sweater! 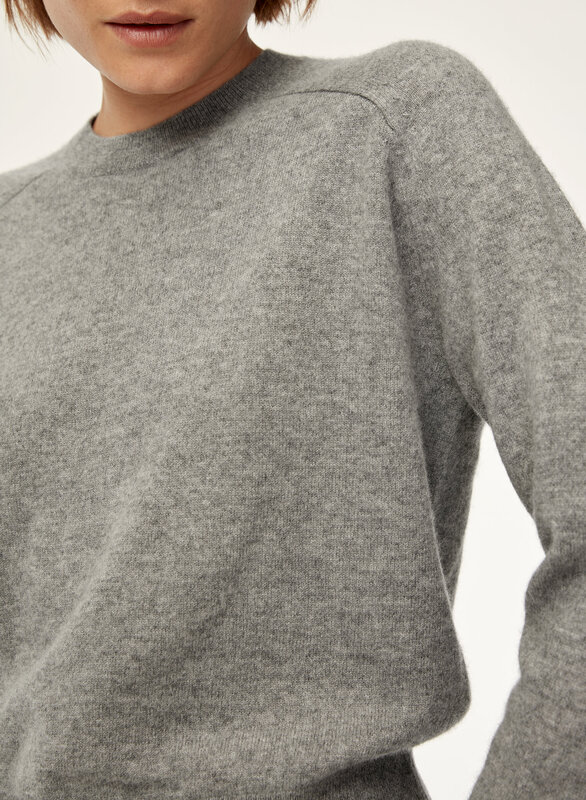 I love Aritzia's luxe cashmere! However, this sweater is definitely tighter than the one I bought last year. I wonder if it has something to do with the fact that they are now machine-washable . . . I love the sweater and the colour but unfortunately the arm length was too short. I usu. wear a small but would need to size up but it’s now unavailable. Hopefully there will be more soon. This sweater is much more cropped that described, or represented in the pictures. 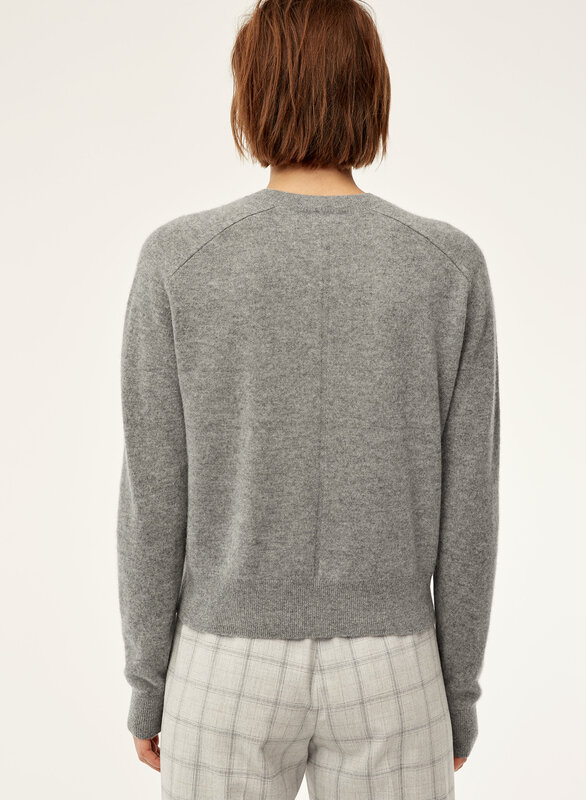 I wish Aritzia would show clearer pictures - straight on, side, and back, so you know what you're getting. It's always a surprise when you order online to see how an item really fits because the put the models in cool editorial positions instead of showing you how an item actually fits. Loved the sweater. So soft. I washed it as instructed on label and it shrunk in length about 2 inches. So disappointing. Very soft and comfortable but still chic to wear it at the office. I wish they had more of my sizes in the other colors. Could have bought a smaller size but I like my sweaters to be a little loss. 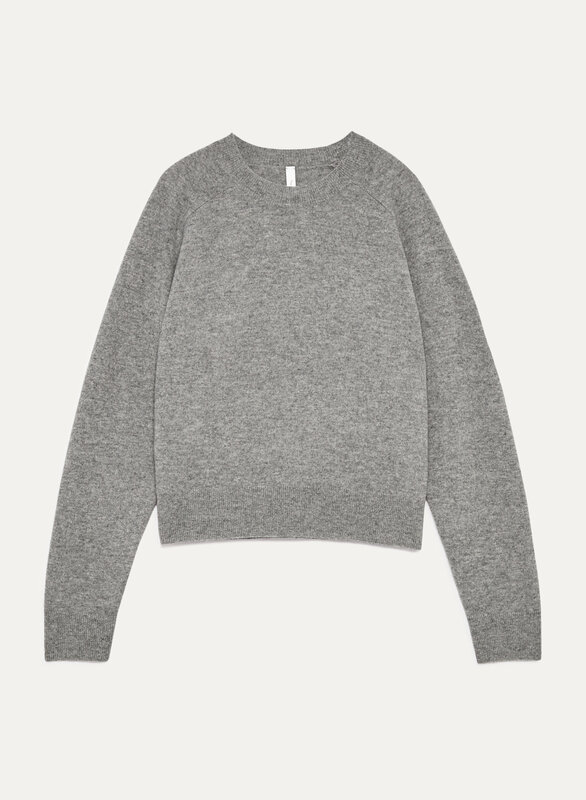 This is an affordable, versatile cashmere sweater that can be dressed up or down. Great selection of colours. I can't wait to wear mine with a pair of higher rise jeans and a statement belt. I ordered my usual xxs, which fits me exactly, but wish I sized up for a little more length in the sleeves and coverage at my waist. XS is not a big difference in size, just a bit more roomy for a casual look. Overall, I love the simplicity and quality of this style! I gave 4 stars wishing the xxs was a tad bit longer. 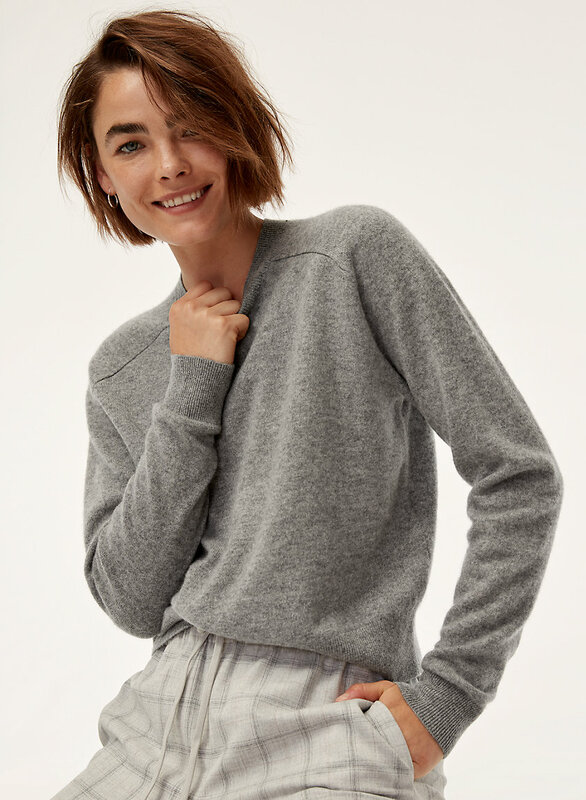 I have this sweater in heather warm grey and condoran. Versatile and flattering fit that complements my workplace skirts and pants as well as my weekend leggings and jeans. I find that wool is scratchy but this cashmere knit is soft, warm and comfy. This sweater is super comfortable and warm as well as looks great! Such a good cut and fit. I want it in another color already. I wouldn't have paid full price for it, so thank you Black Friday sales! Just a side note, why don't you post product reviews? I would love if you did. It would make online shopping with Aritzia so much easier, especially given your return policy. Wonderful fit and softness.....exactly what I was looking for.